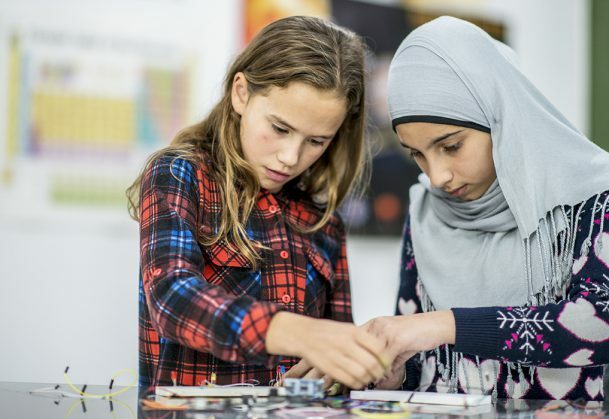 Asking young girls to “do science” leads them to show greater persistence in science activities than does asking them to “be scientists,” researchers at New York University and Princeton University find. The study results are published in Psychological Science, a journal of the Association for Psychological Science. “Describing science as actions, by saying ‘let’s do science,’ leads to more science engagement than does describing science in terms of identities, by asking them to ‘be scientists,’” explains Marjorie Rhodes, an associate professor in NYU’s Department of Psychology and the senior author of the study. Rhodes and her coauthors, who include Princeton’s Sarah-Jane Leslie, note that the messaging children often receive through television shows centers on identity rather than action when it comes to science. In the newly published Psychological Science work, the researchers conducted four studies with children aged 4 to 9 years old. Here, the children received an introduction to science that described science as an identity (“Let’s be scientists! Scientists explore the world and discover new things!”) or as action (“Let’s do science! Doing science means exploring the world and discovering new things!”). By contrast, the effects of language for boys were more variable. For instance, one of their studies found that boys younger than 5 years old showed greater persistence when language was action-oriented while those older than 5 revealed higher levels of persistence when language was identity-oriented. Additional coauthors on the work include Kathryn Yee, a researcher in NYU’s Department of Psychology at the time of the study, and Katya Saunders, a postdoctoral researcher in NYU’s Department of Psychology. This research was supported, in part, by a grant from the Eunice Kennedy Shriver National Institute of Child Health and Human Development of the National Institutes of Health (R01HD087672). All data, materials, and analytic code are publicly available via the Open Science Framework. This article has received the badges for Open Data and Open Materials.